Check clutch line for cracks, deterioration or other damage. Replace any damaged parts. Check for fluid leakage by fully depressing clutch pedal while engine is running. If leakage occurs around connections, reinstall the lines or replace damaged parts, if necessary. Check that the fluid level in the reservoir tank is within the specified range, between the MAX and MIN lines as shown. Check the clutch system for any leaks if the fluid level is extremely low (lower than MIN). Do not spill clutch fluid onto painted surfaces. If fluid spills, wipe up immediately and wash the affected area with water. Connect a transparent vinyl hose to air bleeder of bleeding connector (1). Press the lock pin (1) into the bleeding connector (2), and maintain the position. Slide bleeding connector (1) in the direction of the arrow ( ) as shown. Depress clutch pedal to gradually discharge clutch fluid. 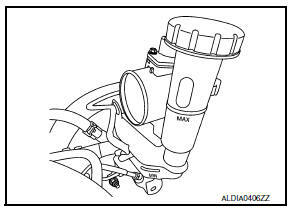 Clutch tube is under hydraulic pressure; do not allow the clutch tube to disconnect from the bleeding connector. Check that there is no foreign material in reservoir tank, and then fill with new clutch fluid. Slowly depress clutch pedal to the full stroke position, and then release the pedal. Clutch tube is under hydraulic pressure; do not allow the clutch tube to disconnect from the clutch housing. Repeat step 5 at intervals of 2 or 3 seconds until new clutch fluid is discharged. Monitor clutch fluid level in reservoir tank so as not to empty the tank. Return clutch tube and lock pin in their original positions while clutch pedal is depressed. Fill reservoir tank with new clutch fluid. Depress and release the clutch pedal slowly and fully 15 times at an interval of 2 to 3 seconds and release the clutch pedal. Slide bleeding connector (1) in the direction of the arrow ( ) as shown and immediately depress the clutch pedal and hold it, to bleed the air from the system. Return clutch tube and lock pin in their original positions. 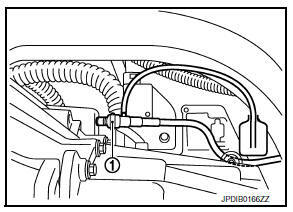 Repeat steps 3 to 7 until no bubbles are observed in the clutch fluid. Check that the fluid level in the reservoir tank is within the specified range after air bleeding. Refer to CL- 7, "Inspection".